Before most consumers had any idea of the importance of aerodynamics on a production car, the Trans Am designers made it an integral part of the package. The average customer believed the sleeker the package, the more aerodynamic the car. This, however was not always the case. Look at one of the Trans Am's contemporaries; the Chevrolet Corvette of the same era. The "Mako Shark II" inspired body screamed sleekness, yet this car was horrible aerodynamicly. There was so much front end lift that driving the car at high speeds was not for the faint of heart. Even pure bred racing cars were not exempt from this concept of "function following form" philosphy. The eventual all-conquering Ford GT40 left the Lola factory as a beautiful race car, perhaps the most visually stunning car of the era, yet was so poor aerodynamicly that the first shakedown runs were disasterous. It was only after serious aero and mechanical tweaking that the car was to become a winner. The Trans Am was different. Pontiac's engineers as well as the design team put together a package that managed the air flow. The made the air work for the car. While the assortment of spoilers, spats, and shakers made a stunning visual impact, the fact that they were designed to work a well as they looked is a tribute to those involved. Front fender exhaust vents have been a part of the automobile for almost as long as there have been fenders on cars. If you care to journey back to the pre integrated fender era, the hood of many cars of the period had vents on the sides of the cars to get rid of excess engine heat. The front fender air extractors on the T/A do remove heat from the engine compartment, but that is just one of their responsibilities. Pure sports and racing cars of the 50's and 60's used fender vents to reduce the air pressure beneath the hood, thereby reducing lift. By giving the air that enters the engine compartment a controlled way out, the air doesn't have to force it's way out the bottom of the car, which lessens the high pressure air beneath the car. In many of todays race cars, this air is now redirected out of the hood thru the use of louvres, which is ok on a race car, but this practice (althougth there are cars that employ vents of this nature) is less practical on a street driven car where water can enter the engine compartment. The front fender air extractor, is the vent is located in a depressed area of the housing, in kind of a backward scoop. 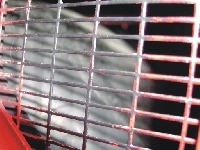 This design takes advantage of the "Venturi" effect, using air flowing accross the air extractor to create a low pressure area, thereby drawing air out of the extractor. This results in something for nothing. High pressure air is given a pathway out of the engine compartment and at speed, a low drag port is molded into the side of the car which naturally aids in air removal. Later, the Camaro Z28 would employ a similar fender air extractor, but this was done more to match the visual appeal of the Trans Am's air extractors. While the front fender air extractors were basicly changeless during the 12-year run of the second generation Trans Am, the spoiler went thru five variations. 1970-1973 - The original front spoiler was an integral part of the aero package of the Trans Am. The spoiler was about three-inches deep and was painted body color unlike the black spoiler of the original 1969 Trans Am. The spoiler ran full width and the ends flowed into the front wheel spats. The front spoiler added real aerodynamic downforce, again at a time in the auto industry was more interested in form over function. So natural and effective this spoiler was, it was used pretty much "as is" when raced in the S.C.C.A. Trans Am series, much unlike today's silhouette cars which run in the series. 1974-1975 - When it was time for the Trans Am to receive the Federaly mandated five mile-per-hour bumper impact standards, the front fascia of the T/A changed drasticly. The new front bumper requires a deeper front pan, so the front spoiler was reduced in depth to a little over an inch. While not as effective as the original, the new spoiler was a bit more more friendly to parking blocks and curbs than if it would have been deeper. 1976 - A new front end with a more integrated appearance debuted in 1976, and with it, yet another front spoiler. This spoiler wasn't much deeper than the '74-'75 version, and it seemed to be a bit more integrated. This spoiler was attached underneath the car behind a flexible, slotted pan. These spoilers mated up quite nicely to the spats, something that became increasingly less common when the pressure was on to increase the production numbers. This spoiler was used only for the 1976 model year so replacements are difficult to come by. 1977-1978 - A new nose piece combining the front bumper and the header panel into a single piece of urethane meant it was time for yet another front spoiler vairiation. This new spoiler was actually a combination of the front under pan and the spoiler. Made in an impact resistant plastic the pan used bolts and tabs extending from the pan to hold it into place. The spoiler portion extended barely over an inch deep and part of its duty was to force air into the vents on the front pan. The ends of the spoiler were intended to line up with the spats, but the results were often not quite as intended. The spoiler/pan was extremely vulnerable to cracking and breaking and it an regular sight to see a '77 or '78 running around "naked"; without the pan. 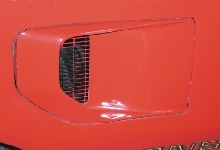 1979-1981 - The final version of the Trans Am front spoiler variation was one that was as much a styling element as it was an effectual component. The new nose was a "bottom breather", whereby part of the cooling air was taken below the car where the turbulent air normally lived, rather than disrupt the smooth airflow that passed over the front end by giving it an opening to glow into. The result was a spoiler that was much larger than the preceeding years. The new spoiler was made of a flexible material so it was much more resilient to life's everyday adventures. Because the new front spoiler was much larger and had a softer shape, new front wheel spats were required. Which front spoiler had the greatest appeal? This is a tough one to call because they all had the same intent and thier design was ultimately determined by the front end style they were attached to. While the front spoiler went thru numerous changes during the twelve year production run, the rear spoiler was limited to two, and these changes were limited to the end caps. Before we examine the end caps singularly, let's look at the rear spoiler as a unit. When viewed end on the spoiler appears to be an efficient devise, carefully breaking up the airflow as it leaves the decklid, lowering drag and increasing downforce. Yes, that's correct, a rear spoiler at highway speeds (around 70 mph) as the original designers had intended creates about 50 pounds of positive downforce. While 50-lbs. of downforce may not seem much in light of modern racing cars creating hundreds of pounds of downforce remember the average passenger car creates lift as if travels down the freeway. Although the downforce generated is wonderful, if the engineers would have truely had their way the spoiler end caps would have taken on a different shape entirely. The designers made original caps come down to almost a point with a rounded top which actually spills air off the spoiler around the back of the car. Pontiac engineers wanted a spoiler that was more squared off and came down the sides straight, to give just that little bit more downforce. Sound familiar, because if you look at the Camaro rear spoiler, this is what Pontiac engineers had in mind. When 1979 rolled around, the Trans Am got some softer shapes. The new nose was softened to break the wind better. The rear bumper was all new as was the entire rear end treatment except for the center section of the rear spoiler. What was new for the rear spoiler were the end caps. The end caps were much larger at the bottom, instead of coming down to a near point, the end caps had a horizontal detail line that met up with a vertical one that followed the leading edge of the end cap. Opinions vary as to which rear spoiler looks the best. The original is tough to beat and did survive for nine years. But the rear spoiler that was used for the final three years was certainly more aggressive, despite being softened, so it to has its own appeal. Like the front spoiler, the rear spoiler is ultimately decided by the year of the car. 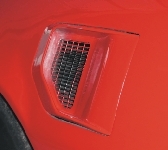 Wheel spats or wheel air deflectors, whichever name you wish to use, were another often imitated component of the Trans Am's aerodynamic package. The spats deflected air around the turbulence of the tires, cleaning up a bit of aero drag for a tradeoff of just a bit of frontal area. In the front, the spats were prone to bug strikes as well a the occasional stone from other vehicles. At the rear, a "sand blast" effect was common as the front tires threw all kinds of road debris rearward, chipping the paint of the spats. There was only one change to the spats design, in 1979, where the spats were made to blend in with the new front spoiler design. During the era, companies offered "foilers", which mimicked the wheel spats, only turned around. These were a very stylish way to add mud & stone deflectors to your car, and unlike many aftermarket add-ons, they actually looked pretty good. The rubber welting was prone to deterioration over time, actually looking quite nasty. Aftermarket companies have offered replacement welting off and on over the years and replacement spats are also in production. The popularity of the Trams Am's wheel spats did not go unnoticed by the other manufacturers. AMC got into the game with the Hornet based AMX. Chevrolet added them to the Camaro Z28 and the Monza Spyder. At Ford, similar wheel spats were added to the 1978 "King Cobra" edition of the Mustang II. All tried to copy the look benchmarked by the Trans Am, but a copy is merely a substitute for the real thing! When it came to interior selection, the Second Generation Trans Ams were at the forefront styling. A beautiful instrument panel, wonderful appearing seats, a variety of sound systems, and a host of luxury and convenience features abounded. This section will go over many of the interior features available on Trans Ams. Of all the neat features ever to grace a Trans Am, the rear seat console has to be one of the best. Ahead of its time, the option had a short lived lifespan, seven production years; 1971-1977. When introduced, the rear seat console gave the rear passengers a center armrest as well as a place to put the inboard seat belt buckles. In 1973, outboard retractors eliminated the buckles with adjusters. Now the belt webbing was not long enough for the new buckles to fit in the console pockets. While the rear seat console no longer had a functional purpose, the appearance factor was well worth the small cost. In hindsight we can say this, but the reality at the time must have been different. Usually GM will eliminate an option when it falls below the 5% penetration level. 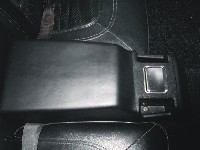 This means in 1977 there was a likihood of only around 7,800 rear seat consoles being ordered (accross the entire Firebird line), so the rarity of this item (as a percentage level) is nearly equivilant to a 1970 Ram Air IV!. With a name like "Formula Steering Wheel" in a Trans Am, it almost sounds like the cart was put before the horse. 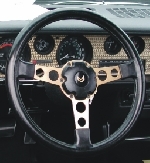 Here was the a steering wheel named after the Trans Am's cousin. Shouldn't the best steering wheel have been named the "Trans Am" steering wheel? 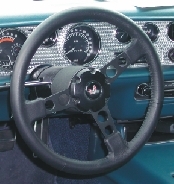 Whatever the chosen name, the Formula steering wheel was almost the perfect appliance to point your Trans Am in the desired direction. The 14-inch diameter was small enough to take advantage of the T/A's quick reflexes and just thick enough to hold onto without your fingers wrapping around too far. The wheel, aside from color changes remained basicly unchanged for it's 12-years of usage. 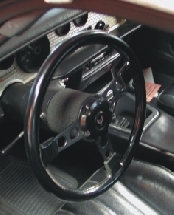 The wheel was available in colors that matched the interior; unlike the 3rd and 4th generation wheels that are available in any color you want as long as it's black. The spokes were available in a black finish, a natural finish, or in the gold finish of the SE's and LE's. Horn caps mimicked the wheel rim color, and on the special models, the bird in the center was unique to the model. 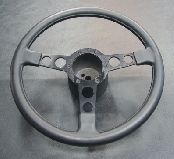 The wheel rim section was held to a cast aluminum collar that was finished with a "crinkle" paint treatment. Allen head bevel screws attached the wheel to the collars and were coated with a "thread locking" material to keep the threads from backing out. After all, it would be bad news to require your customers to periodicly tighten the steering wheel. 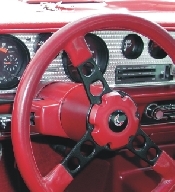 From 1970 to 1972, the steering wheels included a stitched wrapping, but beginning in 1973 the wheel rims were made of a rubberized vinyl with a simulated leather covering, right down to the fake stitching. On 10th Anniversary models, the wheel was treated to a real leather covering, complete with genuine stitching! The leather was a medium gray color to match the horn button and most of the other interior appointments. The spokes were done in a semi-machined finish with the left and right spokes having a straight accross pattern, and the vertical spoke having it's grain going up-down crossing the left-right pattern behind the horn button. Most cars received a low gloss black finish, a natural silver finich on 10th Anniversary models, and as mentioned above, the SE and LE's were given a gold tone. This steering wheel was indeed near perfect. My only complaint with the wheel is that angle of the non-tilt wheel obscures the speedometer with the top of the wheel rim when going straight ahead. Then again I'm a short guy so this might not be a problem for those of you who are not vertically challenged. The interior of a Trans Am could be equipped from spartan to lavish. During the 2nd Gen's production run, you could equip your T/A from basic vinyl, to lavish leather. There were seats called "horse collars" and seats tagged with the prestigious Recaro nameplate. From Madrid Vinyl to Hobnail Cloth, the Trans Am always had an appealing interior. The T/A had an edge on the sister Camaro as the Camaro's best was just about even to the Trans Am's worst. (Whoa did I use "worst" in the same sentence as "Trans Am"? Sorry, just trying to get a point accross!). The 1970 Trans Am holds the distinction of having several one year options: The 400 V8 was available in two variations, the Ram Air III, and Ram Air IV, both with compression ratios over 10.25:1. 1970 was the only year with a 12-bolt rear axle. 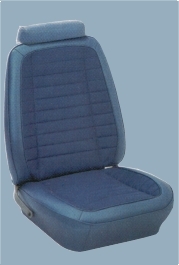 Another feature unique to the 1970 models were the low back bucket seats. The low back seats in Trans Ams all featured an adjustable head restraint, a costly feature thathad been added to the seats of cars of the '60's. Later Firebirds would use a stylish yet inexpensive to manufacture high back bucket seats. As in it's predecessor, (the '69) there was a full with rear bench seat, unique to 1970. 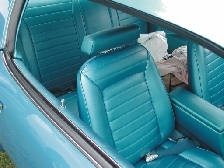 Three seat trims were available, standard Madrid grain vinyl, the optional Deluxe trim with Madrid and Comfortweave vinyl, or a cloth and vinyl combination. When the 1971 Trans Am was introduced, the bucket seats were as radically different between the 1970 models as the 1969 varied in body shape. 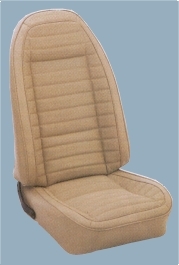 The new seats were a wonderfully modern high back design with a pleated headrest that was now an integral part of the seat. 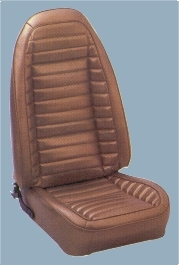 This basic seat design would remain relatively unchanged until the end of second generation production. The new buckets wrapped around the passengers in the seatback portion of the seats much better than the nearly flat profile of the '70's seats.The seats were finished in Madrid Vinyl. The 1971 Deluxe interior was similar in design to the 1970 seats, with comfortweave (knitted) vinyl inserts with Madrid vinly bolsters. The seats had a great look with the comfortweave portion stretching from the center part of the seat and being pleated and seamed at the bolsters. For 1972, the seat pattern retained the same basic shape and sew style, but the comfortweave insert was replaced perforated Tetra vinyl insert. What a change for 1973. 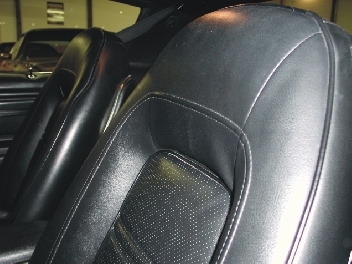 The bucket seats now took on the most expensive looking interior offered in a Trans Am until the 10th Anniversary model rolled around with genuine leather. 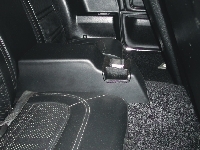 The seats retained the same fabric, Madrid vinyl for the seat bolsters and perforated Tetra vinyl inserts. 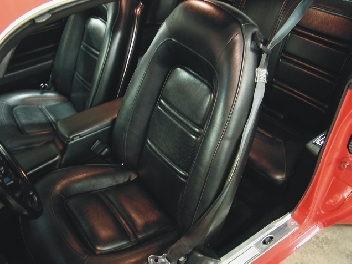 These seats screamed sit on me with a the deep bucketing in the center part of the seat with aggressive "wrap-around" bolsters on the seat cushion and back, helping to keep you in place when you hustled your Trans Am around the corners. 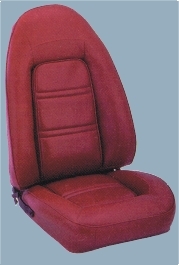 The seats illustrated are from the National Parts Depot catalog. 1-800-235-3445.